A duvet cover for your down comforter can protect it from body oils, dirt, and dust. Comforter covers with pore sizes smaller than 10 microns can provide protection from dust mite allergens as well. A wide variety of beautiful covers is available in just about any fabric; these duvet covers will add color and design to your bedroom, and many of them can be washed frequently. If your comforter does become soiled, spot treat it promptly with warm water and a mild detergent. Pull the soiled fabric area away from the underlying down and feathers, carefully moisten and clean the affected area, and blot it dry with a clean, colorfast towel. Hang it out to dry in a warm, well-ventilated location. Shaking your down comforter frequently will keep the down fluffy and keep it from bunching up and clumping together. From time to time, air out your comforter by shaking it out a window or hanging it on a clothesline. This will help to keep it fresh and sweet smelling. A down comforter may be washed in a large size washing machine. Spot treat any stains and wash it in cold water. Dry it in a dryer on a low heat setting, adding a few clean tennis balls to keep the down fill from matting together as it dries. If no tennis balls are available, you may periodically remove the comforter from the dryer and shake it during the drying process. 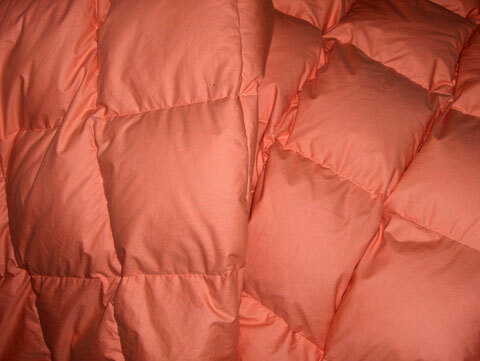 If you prefer not to wash your comforter, it may be dry cleaned periodically every few years. Store your down comforter in a dry, ventilated place when you are not using it.